This week I am looking at the names we give our weekdays and the links to Norse and Anglo-Saxon mythology. Click the following links to read about Sunday and Monday , Tuesday , Wednesday and Thursday. Today it is the turn of Friday. Friday in old English is Frīġedæġ the day of Frigg. Frigg or Frigga/ Frige was the goddess of love and a parallel to Venus from whom we get Vendredi in Latin languages. Frigga was the wife of Odin and Queen in Asgard. She was seen as the goddess of family and home and women. She is prayed to during child birth. Frigga played an unwitting part in the death of Baldur brought about by Loki. Baldur was immune to all attaches but, in disguise, Loki asked Frigga if ANYTHING could halm him. Frigga confessed that a spear made from Mistletoe would hurt him. Loki arranged for another god to throw the spear and so Baldur was killed. The Norse name for the planet Venus was Friggjarstjarna meaning ‘Frigg’s star’. 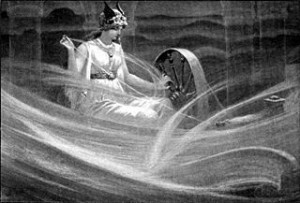 Orion was called known as “Frigg’s Distaff/spinning wheel” (Friggerock) or sometimes as “Freyja’s Distaff” (Frejerock). This is the end of this little series. Why no Saturday? Saturday is the only day of the western/ English naming system that comes from Latin – in this case Saturn’s day. What would the Saxon have called Saturday. Well the old English for it was sunnanæfen which equates to modern German Sonnabend or Sun’s eve. The day before Sunday. Which brings us full circle to where we started in part one.